Hidden in a recent China Daily story about Beijingers’ work habits was this statistical nugget: Beijing men spend almost as much time (1 hour 50 minutes) on daily household tasks as women (1 hour and 58 minutes). The study, released last week by the Beijing survey office of the National Bureau of Statistics, polled 4,238 people older than 15 in 1,700 households in Beijing. 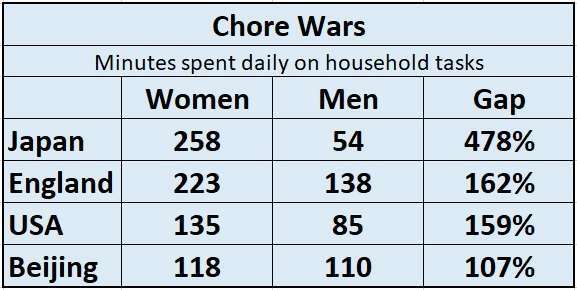 If true, this would make Beijing one of the leaders in the “chore wars” as the vast number of reports on this issue we’ve found from other countries show that women do far more housework than men. A 2015 survey in Japan showed a striking 3-hour gap per day on weekdays between both genders, with adult men spending only 54 minutes on chores, compared to women who did roughly five times as much. Meanwhile, adult American men accomplish 41 percent of what women can do in daily household activities (1 hr 25 min vs. 2 hr 15 min per day), the US Bureau of Labor Statistics said in a 2015 study. Adult British gents shouldered 2 hr 18 min of housework per day, compared to the work done by ladies (at 3 hr 43 min per day), according to a 2016 report by the UK Office for National Statistics. While the methodology and the definition of housework may differ in each of these polls, what is clear that the Beijing statistics indicate a much smaller gap between men and women in regards to time spent on household chores. The Beijing survey did not specify what constitutes “housework” — but it is likely the broad definition that could include tidying the home as well as things like childcare, which, in Beijing terms, could be shuttling children to and from school and after-school activities. Also lost in this study is how many people have ayis or other hired help who assist with maintaining a household. At least in the middle and upper-income brackets of wealthy Beijing, ayis seem exceedingly common. How much time do you spend on chores? We’re conducting a quick poll to see if the beijingkids community shares Beijing’s unique male-female divide of housework. Vote below and we’ll share the results next week here on the blog.